Made Up Mind is a brilliant throwback without ever truly sounding anachronistic. What do you get when you mix a captivating husband-wife duo with the considerable talents of nine others? The result, my friends, is the supremely talented Tedeschi Trucks Band, fronted by guitarist/vocalist Susan Tedeschi and guitarist Derek Trucks. On Made Up Mind, the superb followup to the acclaimed debut effort Revelator, the 11-piece band delivers compelling performances that showcase the upmost musicianship. Compiled of a mix of blues, folk, classic rock, gospel and retro-soul sensibilities, Made Up Mind is a brilliant throwback without ever truly sounding anachronistic. Title track “Made Up Mind” opens the effort brilliantly. The overall production is sensational, with the horn orchestration standing out amongst the rest. Tedeschi sounds invested vocally and incredibly soulful and nuanced. By the end, she lets loose, showcasing exceptional grit characteristic of the blues idiom. “Do I Look Worried” follows with brilliant consistency, based in 6/8 time and smothered in soulfulness. Like the opener, Tedeschi’s professionalism, particularly her ability to deliver an engaging and rousing performance, shines throughout the course of this cut. Throw in exceptional guitar soloing, and Made Up Mind shimmers with radiance two tracks in. “Idle Wind” has the tall task to proceed two juggernauts, but it holds its own well without superseding either. Although it’s still captivating, “Misunderstood” is more well rounded, based around a funky sound. In regards to songwriting, the cut is incredibly well conceived and quite memorable. Supporting vocals add to the delightful ‘ear candy’ provided by the band. 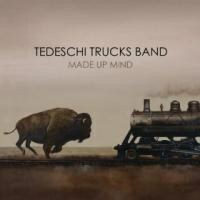 Keeping right in step, “Part Of Me” thrives, once more showcases the ridiculous talents of Tedeschi and Trucks. Follow-up “Whiskey Legs” features some of the album’s best guitar moments, with dueling guitars serving as the epitome of musicianship. “It’s So Heavy” is truly ‘heavy’, but even with the slackened pace, energy and the personality remain fully intact. Tedeschi’s vocals are smooth, yet still retain a coarseness and nuanced nature that makes her so desirable to listen to. The guitar solo may lack crazy, virtuosic shedding, but it’s sensible, smart pacing still provides plenty of weight. “All That I Need” is definitely groovier than “It’s So Heavy” based in retro-soul sensibility, but doesn’t supersede the more restrained number. That said, “All That I Need” benefits from its simplicity, particularly the titular lyric which makes quite an effective refrain (“You’re all I want and all that I need … ”). “Sweet and Low” continues the oscillation between slow and fast tempos, opting for a more relaxed vibe. And R&B edge rears its head from the backing vocals, which add a sound amount of soul. An adventurous harmonic scheme keeps “Sweet and Low” relatively interesting, but the song does feel a bit too slowish and drawn out after a while. Penultimate cut “The Storm” is brilliant atonement with nothing short of a head-nodding groove, but perhaps is most notable for its extended jam session at the end. “Calling Out to You” is none too shabby itself, closing an exceptional album strongly. All in all, Made Up Mind is one of the more intriguing efforts from 2013. Combining cues from multiple styles and showcasing top-notch musicianship, there are few cons to scrutinize. Maybe a song or two oversteps with ambitious durations, but ultimately, there are just too many attributes and too much great singing and playing from Tedeschi Trucks Band to be critical.